Certain scents will always remind us of Christmas, like the amazing smell of real Christmas trees and mulled wine with warming spices and orange. For me gingerbread men and Christmas candy are another favourite Christmas smell, but that’s another blog. I love having fresh arrangements in the house at Christmas. Traditional winter foliages like holly and spruce are perfect for Christmas designs as they are very hardy so last extremely well. You could have garlands of spruce and holly hung on the staircase or table arrangements with orange slices and cinnamon. 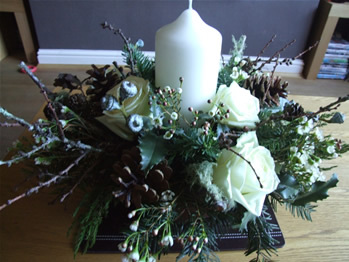 Big chunky candles are perfect in Christmas arrangements. For a lovely natural feel in this arrangement I’ve used lichen covered twigs, pine cones, spruce and scented wax flower with a few white roses. 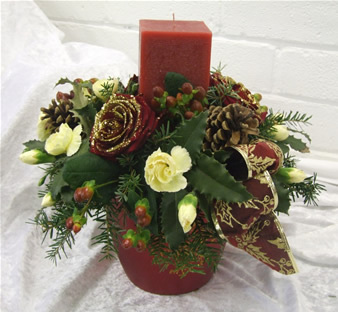 You don’t need many flowers in Christmas arrangements just lots of nice foliage and accessories like pine cones, cinnamon and berries with some pretty fabric ribbon. In this festive arrangement I’ve used a cinnamon scented candle in a red container with pine cones, holly, pine branches and glossy red hypericum berries (also known as St. John’s Wort). The only flowers are cream spray carnations and some glittered Grand Prix roses. 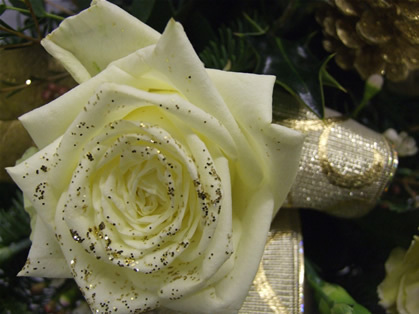 For a more modern Christmas design I’ve used icy whites and iridescent sparkle. The foliage is spruce with silver bear grass and eucalyptus. 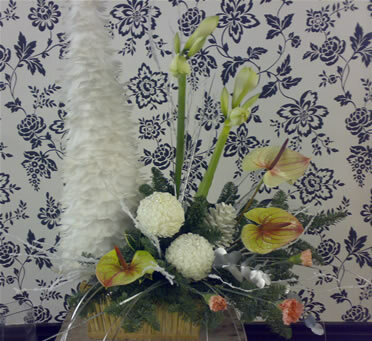 It includes long lasting anthuriums, chrysanthemum blooms and carnations. The amaryllis will open into beautiful large white blooms. The feather Christmas tree sparkles with iridescent glitter.